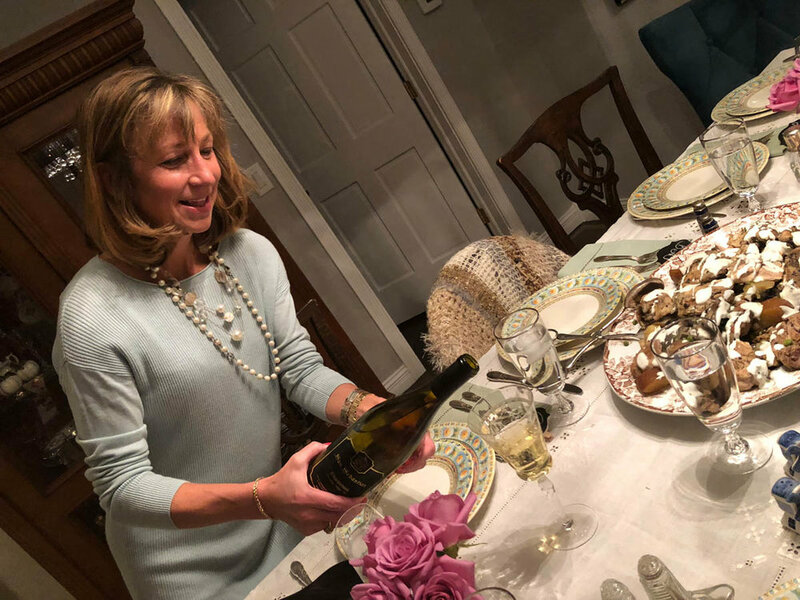 I love to entertain and once a year I look forward to welcoming a very special group of women to my house whom I was fortunate enough to meet in a bookclub fifteen years ago. My friend Beth had started this book club a few years prior and after meeting her in the neighborhood one day, she invited me and another friend to join them one night to see if we might be interested in joining. I have to say that I was a bit nervous since a) it had been years since I'd read any book other than a parenting book, or a children's book, b) I didn't know these women and I'm a bit shy at first, and c) surely they would be much smarter than I was. Well, I went anyway, and enjoyed a glass of wine, dessert, and getting to know a group of women who would become some of best, and closest friends I've had. They would also be a support system for me when life got hard. One of the best parts of our book club is that we all embrace our differences and love each other for who we truly are. There are no pretenses or gossip (not much anyway) and we all care deeply about each other's happiness. Over the years, things have been shared while discussing books that may have been controversial at times, but we each value the other's opinions, whether we agree or not. We've been through deaths, divorces, and health problems. We've seen each other's kids grow up and offered support and help when one of us needed it. Usually the host of bookclub chooses the book and directs the discussion while we eat and drink. When I hosted recently I chose "The Red Notebook" by Antoine Laurain. This is a darling little book that I highly recommend! It's a short read, about a French Bookseller who comes across an abandoned handbag on a Parisian street. Feeling compelled to return the book to it's owner, he pursues finding one woman in a city of millions. 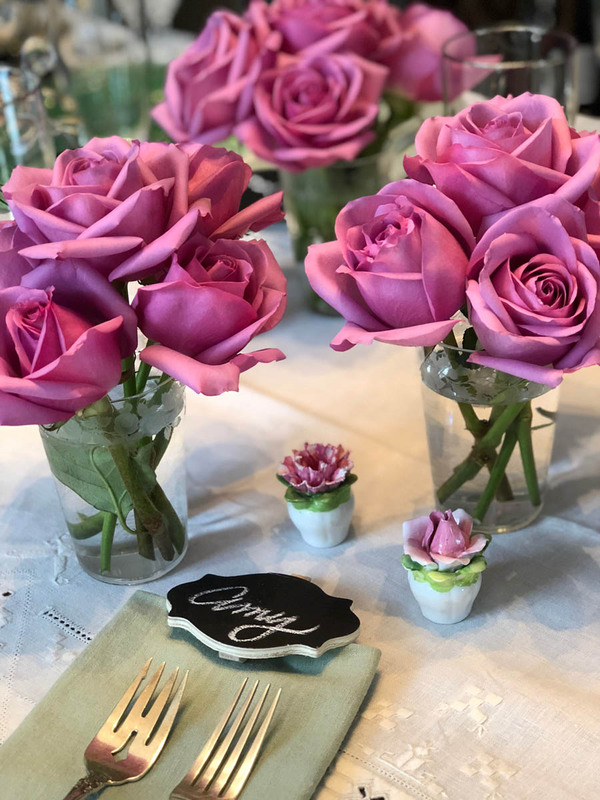 I love a reason to set a pretty table! 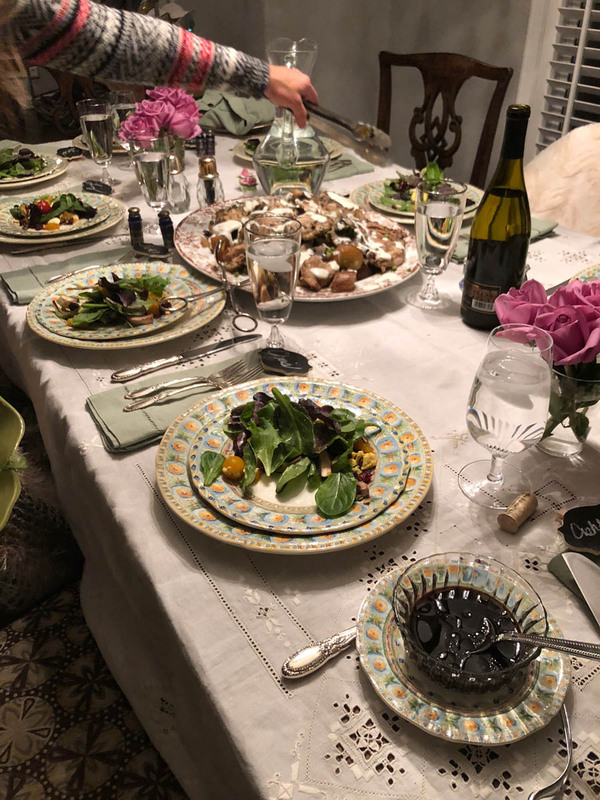 I was so happy that everyone would be at bookclub this month, and since the story for "The Red Notebook" took place in France, I chose to cook a French-inspired meal. I went all out, even printing a menu for our French Feast and I picking up some pretty roses to fill small containers and adorn the table. 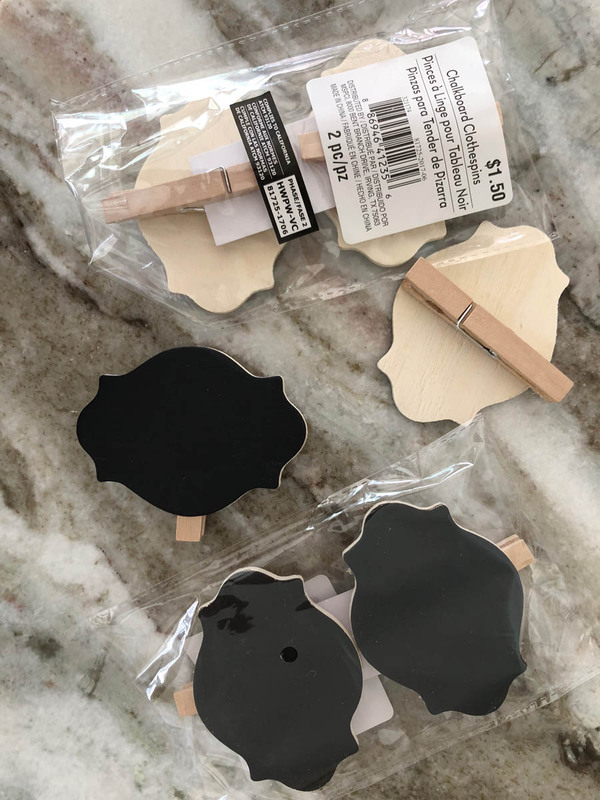 At Michaels I found these cute little blackboard clips and decided to use these at the place settings for a little extra special touch. This was a super easy and inexpensive idea that I'll definitely use again in the future! The main appetizer was a simple, yet pretty platter of cheeses, olives, peas, bread and potatoes. I had choices of drinks, including a French-inspired Chardonnay by the name of San Sebastian. San Sebastian, located in Florida is one of my family's wineries. We've been in the wine business for over thirty years and produce award-winning wines with locations in Saint Augustine, and Clermont, Florida. My brother sent wine from Florida for our bookclub dinner so it was one less thing I had to think about. You can read more on my blog about my Dad's journey in starting these wineries! For a salad I made a simple mixed green salad with almonds, sweet tomatoes and mandarin oranges, which I topped with a simple balsamic vinegar dressing. 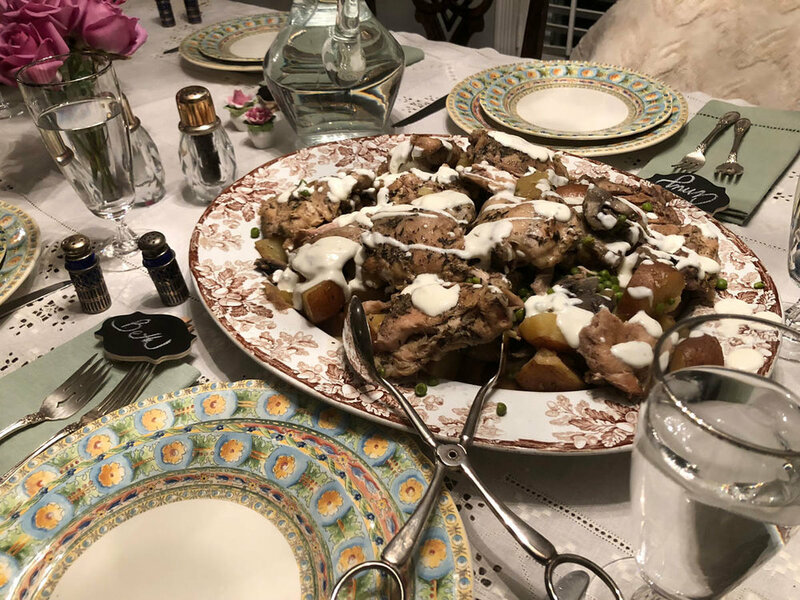 The main course was one of my favorite French dishes called Chicken Fricassee. Believe it or not, I made it in the crock pot, by cooking with potatoes, peas and chicken broth. By marinating the chicken over night, it was tender and super easy to put together. I topped the chicken off with a demi-glace, which gave it a bit more flavor and looked really pretty too! Click here for the easy Chicken Fricassee recipe. To say I'm thankful for my bookclub is an understatement. The support and love they've shown me over the years, during my cancer, divorce and spine surgeries is more than reason to provide a special meal for them! As I write this, our founding member is undergoing colon cancer surgery and I'm sure she knows she could call on any one of us any time for help and support! 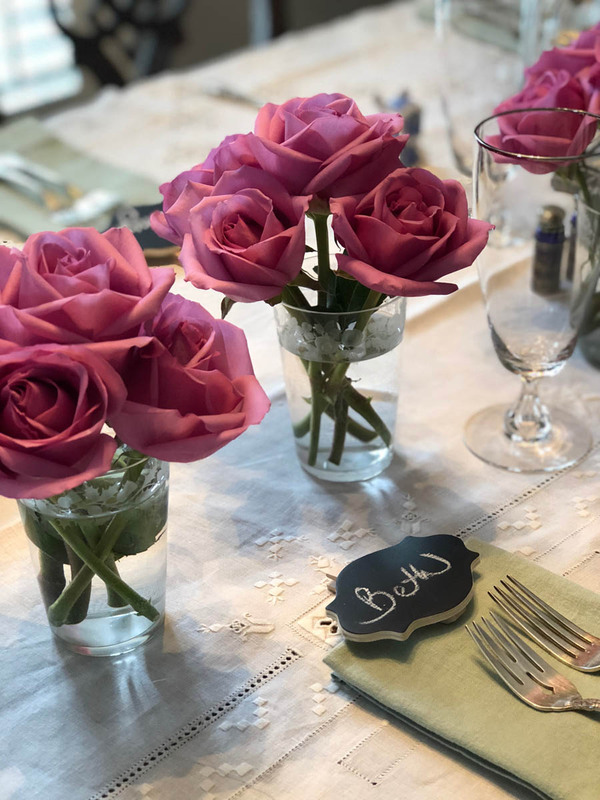 You might also enjoy Southern Ladies' Luncheon: The Art of Preparation & Presentation, and other recipe and entertainment posts.